In just a few steps, you can shut down your entire Yahoo Mail account and revoke access to your email address, remove all your emails, and prevent people from messaging you. What Does It Mean to Delete a Yahoo Mail Account? Deleting a Yahoo Mail account means not only that your emails will be removed and you'll lose access to your account, but you'll also no longer have access to your My Yahoo settings, your Flickr account and photos, and other data stored in Yahoo's services. If you're paying for any Yahoo subscription services, remember to cancel these subscriptions first to avoid unexpected payments. The same is true if you have a Flickr Pro membership. Closing your Yahoo account will not cancel automatic charges associated with your account. Once you close your Yahoo Mail account, anyone who tries to send a message to the email address will immediately receive a delivery failure message. To avoid confusion and concern, be sure you tell your friends and contacts that you are about to close your Yahoo Mail account — both from the email address you plan to use in the future (so they can easily reply to reach you) and from your Yahoo Mail address (to make sure the message is received). See the section at the bottom of this page for more information on what will happen after you delete your Yahoo email address and account. 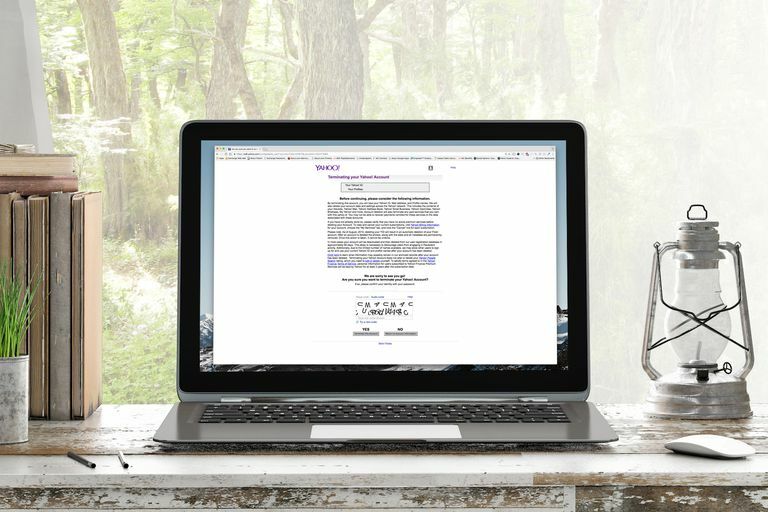 Open Yahoo's "delete user" page and enter your username. Click Next. If you don't see an option to cancel your account, and think you might have a BT Yahoo Mail account instead, see below. You can recover your forgotten Yahoo Email password if you're not sure what it is. Enter your password. If you have an Account Key set up, Yahoo will send a message to your mobile phone to authenticate you. Read the text on the page titled "Before continuing, please consider the following information." It details what you will lose when you delete your Yahoo Mail account. Click or tap the Continue button. Enter your email address once more into the field provided. Select Yes, terminate this account. You'll know it worked if you see a message that reads "Your account has been deactivated and scheduled for deletion." Click or tap the Sounds good button to return to Yahoo's homepage. In some cases, Yahoo won't actually remove everything for up to 180 days, but that depends largely on the country you signed up from. Data connected to a Yahoo Finance Premium account might be kept for three calendar years. If you got your Yahoo Mail account with British Telecommunications (BT), you cannot cancel the service using the Yahoo Mail account termination page. You can, however, contact BT directly to have your Yahoo Mail Premium account deleted. What Will Happen to My Yahoo Mail User Name and Email Address? Your username and email address will be available for others to use in the future, so they might receive messages meant for you if senders still use your old email address. Can I Reactivate a Closed Yahoo Mail Account? Yes, you can reactivate your account even after you've marked it for deletion. To reopen a deleted Yahoo Mail account, just log on to the account within 40 days after deleting it. You can do this through the regular Yahoo Mail web page. Once you've reactivated the account, you can start getting emails once again, but know that you will not be able to see any emails that were sent to the account while it was closed. What Happens to Emails Sent to My Address After I Close My Yahoo Mail Account? In the meantime (starting as soon as you close your account), senders trying to message your deleted Yahoo Mail account's address will receive a delivery failure message. However, this message will no longer be seen if you reactivate your account as described above.